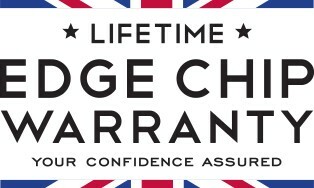 All collections designed and manufactured in our Stoke-on-Trent factory are covered by a lifetime edge-chip warranty. Engineered design ensures maximum performance. Each piece is inspected, examined and tested so you can be confident it will withstand the demands of the modern kitchen and remain chip free. 1. The handles, lugs or knobs on cups, mugs, jugs, tea/coffee,pots and other holloware items. 2. The verges of tea/coffee pots. 3. The spouts of tea/coffee pots or jugs.